"This is the film most baby-boomers saw in U.S. movie theaters and on TV. Fans had to rely on badly cropped VHS and DVD bootleg copies to enjoy the film thereafter." 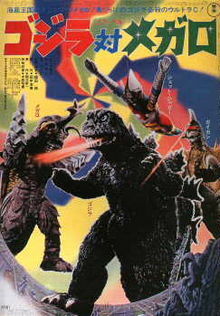 Godzilla vs. Megalon (Gojira tai Megaro) was the 13th entry in the Godzilla series. It was the first film in the series to have someone other than veteran suit performer Haruo Nakajima in the role of Big G, with Shinji Takagi taking over the rubber suit. Interestingly enough, this wasn't going to be a Godzilla film. To cash in on the Kyodai Hero craze, Toho held a contest in 1972 to make a tokusatsu hero that would appear in its own film. The winning entry was from an elementary student, who called his creation "Red Arone". Toho changed the name to Jet Jaguar, and he was set to star in Jet Jaguar vs. Megalon, but, unfortunately, was found not to be able to carry the film. Tomoyuki Tanaka suggested adding Godzilla and Gigan to the film. In order to make up lost time, the film was shot in three weeks and, all in all, production time lasted six months. The film bombed at the Japanese box office, and Jet Jaguar didn't get the intended series. For everything its predecessor did wrong, Godzilla vs. Megalon did it that much worse. Stock footage abounded, the special effects were dodgy at their zenith, and much of the plot was contrived. Nevertheless, the film was the subject of a heavy marketing push, and saw decent theatrical success in the United States, where it was released to cash in on the success of King Kong (1976). Megalon was nevertheless well-liked, and a series of video games redeemed Jet Jaguar in the eyes of many fans. The plot centers around the conflict between an undersea civilization known as Seatopia. Nuclear testing has severely impacted their people, and as revenge against the surface people, they plot to unleash the wrath of their god, Megalon. The Seatopians set up a base by drying out a lake where our ostensible human protagonists, an "inventor" named Goro Ibuki, Goro's younger brother Rokuro and their friend Hiroshi Jinkawa, are trying to relax. They don't take it well. The Seatopians attempt to steal Jet Jaguar, a prototype robot, from the inventors. The first attempt, while the robot is still incomplete, is less than successful, but the second time sees them capture not only the robot but the three humans. The brothers are sent to be offed, while Jet Jaguar is turned against Japan and used to direct Megalon towards Tokyo. The heroes escape from the clutches of the Seatopians, and after meeting up with the always hapless JSDF, manage to regain control of Jet Jaguar and decide to call in Godzilla to combat Megalon. With the guidance of Jet Jaguar removed, Megalon is reduced to flailing around and stomping on a few redshirts. Upon learning of Jet Jaguar's recapture, the Seatopians send out a distress call to the Nebula M aliens, requesting Gigan's assistance, which in no way is an excuse to rely overly on stock footage, no sir. A.I. Is a Crapshoot: Subverted by Jet Jaguar. He is content to be controlled like any robot - until danger is about, at which he becomes a Big Damn Hero and takes control of himself. Anti-Villain: The Seatopians, and by extension Megalon. Their bizarre decision to send Megalon to attack Japan for nuclear weapons testing (!) aside, you can't help but feel they're a little entitled to be ticked at the surface world routinely exploding nukes, threatening their underground civilization with constant earthquakes. Artistic License  History: About the Easter Island Statues in the Info Dump, one of the main characters states they are 3 million years old (huh boy....). Big Dam Plot: Megalon destroys the Ogouchi Dam in the film's most elaborate set piece. The Cameo: Anguirus and Rodan, during the Monster Island scenes. Dolled-Up Installment: It wasn't going to be a Godzilla movie at first, but Toho had doubts about Jet Jaguar being able to carry the film by himself. Dumb Muscle: Megalon. Seriously. Removing Jet Jaguar as a guide reduced him to basically nonfunctionality. Fan Service Extra: If the watcher can get over how strangely dressed they are the Seatopian dancing women are indeed mostly wearing swim suits and boots. The pin up girls on the back of the truck. Gratuitous English: Rokuro wears a Snoopy sweatshirt with a "That was a stupid thing to do" thought balloon. It Is Pronounced Tropay: Jet Jaguar's name is always pronounced as the British "Jag-you-ar". MacGuffin: Jet Jaguar arguably serves as one for the first two-thirds of the plot, first guiding Megalon and then serving as the means to contact Godzilla. Minimalist Cast: The number of characters with on-screen, speaking roles can be counted on two hands. Opening Monologue: Ted Thomas' deadpan delivery of "In the first part of 1971, on a small island near the Aleutians..." in the English version is unforgettable and has become a bit of a meme to a few. Plot Hole: A minor one: Our heroes suddenly know Megalon's name despite never being informed of it. Averted in the dub, in which Megalon is only referred to as "the monster" by the surface dwellers. Poorly Disguised Pilot / Still Born Franchise: This was going to be a vehicle to cash in on Ultraman. Needless to say, it didn't work. Which makes Godzilla's appearance in Zone Fighter Hilarious in Hindsight. Recursive Translation: Robert Dunham, who played the Seatopian Leader, read his lines in English on set, was dubbed into Japanese (by Goro Naya), and then those lines were translated back into English. It shows. Ring of Fire: Megalon manages to trap Godzilla and Jet Jaguar in one until Jet Jaguar flies them out. Ripped from the Headlines: The United States did in fact conduct an underground nuclear test in 1971 on the Aleutian island of Amchitka , but, contrary to the opening narration, it was in November, not the "first part" of the year. Screw This, I'm Outta Here! : At the climax of the ending fight, Gigan flies off after taking a couple of shots of Godzilla's atomic breath, while Megalon, after getting double-teamed by Godzilla and Jet Jaguar, flees to one of Seatopia's underground doorways, which Seatopia detonates immediately after. Shoot the Hostage Taker: When Gigan grabs Jet Jaguar and tries to use him as a shield, Godzilla blasts him in the face with his atomic breath without missing a beat. Size Shifter: Jet Jaguar, for no discernible reason! The Song Remains the Same: Foreign dubs usually end with the untranslated version of "Godzilla and Jet Jaguar: Punch! Punch! Punch! "note the Italian dub just uses the instrumental bed. The song's Japanese lyrics are only slightly less goofy than the Mystery Science Theater 3000 Gag Sub. The footage of the "nuclear test" at the beginning is from the end of Ebirah, Horror of the Deep. Godzilla jumping into the ocean is also from the same film. Megalon's powers seemed to be made for this. His lightning attack is an excuse to borrow King Ghidorah's Gravity Beam footage and his Napalm bombs are built for generic explosion scenes. The three tanks being blow torched make their fourth appearance since Mothra vs. Godzilla. One shot of the tanks has King Ghidorah and Gigan approaching in the background. Megalon's arms infamously turn into Gigan's hooks when he's destroying planes. The sequence of Gigan ducking for cover behind trees from Godzilla vs. Gigan, which was already mostly made up of stock footage taken from War of the Gargantuas, is reenacted here by Megalon. Like in vs. Gigan, it's plainly obvious that the creature moving behind the trees is a hairy Gargantua. Tempting Fate: Rokuro tells Jinkawa he feels more secure driving vehicles on land instead of water. Cue him getting kidnapped by the Seatopians minutes later. Villainous Friendship: Megalon and Gigan seem to have shades of this in their interactions.